← How could I convert Turkish PDF to JPG with good quality in appearance? Ellipse-shaped comment is inserted in some books as annotation, then some words are added to the annotation, thus ellipse-shaped comment plays a role in further explanation. And in astronomy ellipse is an universal issue, the track of stars is an ellipse, so with PDF PDF Editor we can produce the kind of track. 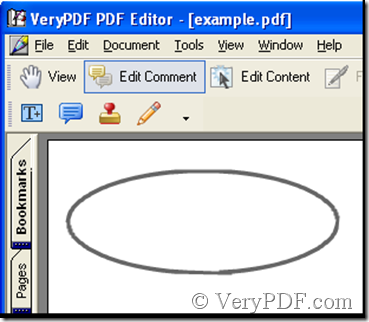 Here in order to contact with VeryPDF PDF Editor ellipse-shaped comment is called pdf ellipse, from the preceding introduction we have knowledge of pdf ellipse that is a footnote where you need write some words. Next is the operation for adding pdf ellipse. 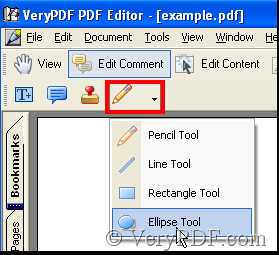 Click Edit Comment in the toolbar thus there are four icons in active state, click the last one marked by the red rectangle and choose Ellipse Tool. Double-click the pdf ellipse, then a textbox pops out where you can write. 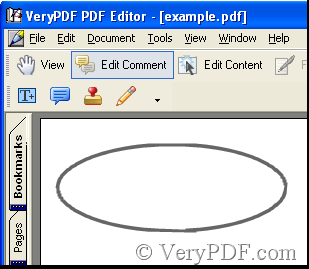 For example in the Ellipse-admin of pdf ellipse enter www.verypdf.com. Double-click in Ellipse-admin and begin to write. 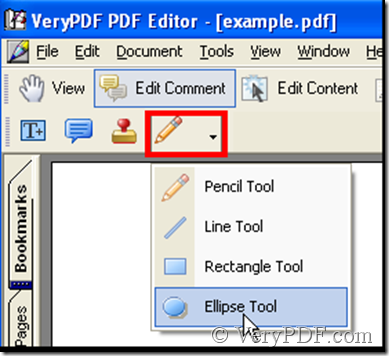 The Ellipse-admin of pdf ellipse can be concealed, if you want it appear again, double-click pdf ellipse anew. How to add Japanese font in PDF? This entry was posted in PDF Editor and tagged pdf ellipse. Bookmark the permalink.